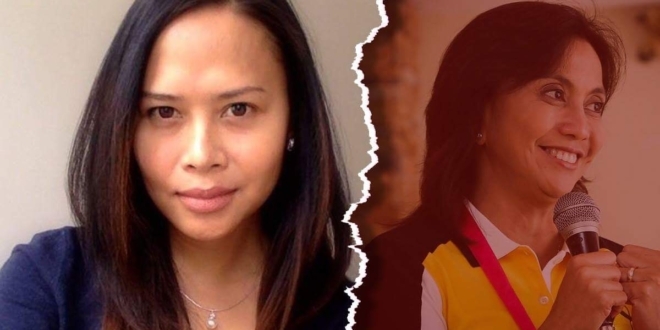 Home / News / Politics / Int’l relations expert challenges Leni to an interview, "I will give you questions one month before"
Int’l relations expert challenges Leni to an interview, "I will give you questions one month before"
Political columnist and blogger Sass Rogando Sasot, who has been known for her vocal stance supporting President Rodrigo Duterte, has challenged Vice President Leni Robredo to an interview. "Some of your supporters tell me to be fair to you. Heeding their advice, I want to be fair to you so I would like to pick your brains on geopolitical issues and directly ask you to clarify your views that I find problematic," Sasot said. This was subsequent to Robredo's statements on Monday slamming the government for not moving on the territorial dispute with the West Philippine Sea despite a victory in the Hague against China'sclaim on the waters. “We soften our stance on the West Philippine Sea to avoid conflict, but the conflict we seem to be scared of is already at our doors. Our fisherfolk are physically restrained with guns, ammunitions, ships, and intimidation, to prevent them from fishing in waters that have already been affirmed as part of our Philippine territory,” she said. “Ironically, however, our own government continues to call the West Philippine Sea as ‘disputed’ waters and the Philippines as a ‘claimant’, seemingly ignoring the fact that the arbitral tribunal has already ruled in our favor,” she added. Sasot said that Robredo could take the interview as an opportunity to clarify her foreign policy outlook. "So, in the spirit of fairness, I really would like to interview you live and ask you about the recent international relations-related statements you issued," Sasot said. She even added that she will give the Vice President a month to prepare for her questions. "And as a form of sweetener, I'm willing to give you the list of questions ONE MONTH in advance so you could prepare. Thank you and I look forward to hearing from you," she said. Sasot has been a vocal critic of Robredo since the latter was appointed VP. Some of your supporters tell me to be fair to you. Heeding their advice, I want to be fair to you so I would like to pick your brains on geopolitical issues and directly ask you to clarify your views that I find problematic. Maybe, through this interview, you could convince lots of skeptical people like me to adopt your foreign policy outlook. I mean, what could possibly go wrong in this interview? I'm sure my readers will learn a lot from your insights. So, in the spirit of fairness, I really would like to interview you live and ask you about the recent international relations-related statements you issued. And as a form of sweetener, I'm willing to give you the list of questions ONE MONTH in advance so you could prepare.